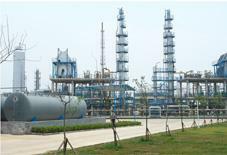 There are two prevailing processes for sec-butyl acetate (SBA) production, i.e. 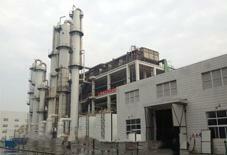 iso-butanol-acetic acid esterification process and n-butene -- acetic acid addition process. Due to its much lower production cost, new SBA plants usually use the Addition Process, which is the very technology SL TECH provides. 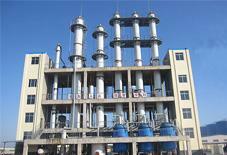 It consists of four units, feedstock purification unit, esterification unit, product separation unit and acetic acid recovery unit. Compared to the Esterification Process, the Addition Process for SBA production has advantages such as shorter process flow, less equipment and lower production cost (50-60% of Esterification Process); lower energy consumption (only 5% of Esterification Process); easy operation, lower maintenance cost and lower operation cost; harmless and poisonless solid acid catalyst, less pollution, less equipment corrosion. 1. Fixed Bed tubular Reactor To ensure the separation effect in the reactor, a disc distributor is arranged at the feedstock inlet; to strengthen the heat exchange effect and better control the temperature in the catalyst bed, baffles are designed in the reactor shell side; to reduce the energy consumption, two pre-heating stages are designed, the first stage is the plate heat exchanger while the second stage is the tubular heat exchanger. 2. Modified Cation Exchange Resin Catalyst The catalyst is high temperature resistant strong acid resin modified by metal chloride to prolongitself service life. Also after the modification, the conversion yield as weel as the selectivity will be increased at some extent.